A few weeks ago, I set up our little sand box. In past years, we had a problem with ants hanging out in the sand. Awhile back, I had read that cinnamon is a natural ant deterrent. I decided to try this theory out and add some cinnamon in with the sand. It worked! 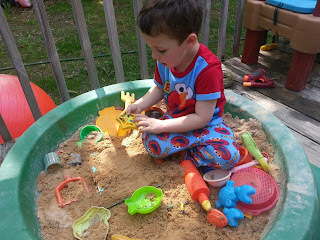 We have had an ant free sand box for over a month and the sand smells awesome! It is actually kind of funny, you can actually see the ants climb up the side of the sand box and retreat as soon as they smell the cinnamon! All I did was sprinkle cinnamon on the top of the sand and then mixed it in. Easy, natural, smells great, and keeps the ants away! I've heard that cinnamon works too. My in laws have the worst problem with ants at their house! They could try putting cinnamon in the doorways and windows if they don't like to use chemicals! This was one of the reasons I was reluctant to get a sandbox. Now, I have an solution with built in aromatherapy! Can't get much better than that! What a neat idea!! I have some ants that keep trying to come under my front door and this sounds way better than chemical repellant! !